NOTE: If you are interested in licensing technologies developed by University researchers and staff, you need to visit the Division of Technology Management. 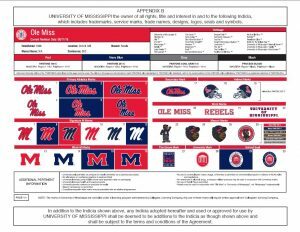 The Department of Licensing was created at the University of Mississippi to oversee use of University licensing marks including, but not limited to, all logos, scripts, images, etc. trademarked or copyrighted by the University for the purpose of furthering the University of Mississippi brand. The University has partnered with the Collegiate Licensing Company (CLC) to oversee the licensing program at the University of Mississippi. Each party desiring to become an official licensee of the University of Mississippi must apply to this entity and become an approved vendor before creating products that may be approved by the University for sale or general use. Failure to obtain a license through CLC and consequently approval from the University on specific design can result in the seizure and possible legal action of all non-approved merchandise bearing University of Mississippi trademarks. Please visit CLC’s website for details on becoming a licensed vendor. A University of Mississippi trademark is any mark, logo, symbol, nickname, letter(s), word or derivative that can be associated with the University of Mississippi and can be distinguished from those of other institutions or entities. Some examples include the script ‘Ole Miss’, Ole Miss Oval, ‘Rebels’, etc. NOTE: This image is intentionally low resolution to prevent unapproved use. NOTE: You must use the approved university colors or the PANTONE © colors listed on this page. The colors on this page are not intended to match the PANTONE color standards. For the PANTONE color standards, refer to the current editions of the PANTONE color publications. PANTONE © is a registered trademark of PANTONE, Inc. Licenses must be obtained for the use of any University of Mississippi trademark, image, or photograph used on any packaging (including hangtags, stickers), signage, or product sold to the general public or to campus departments and organizations. In addition, promotional licenses must be obtained by companies or organizations wanting to associate with the University of Mississippi through any use of its trademarks. WHO ARE YOUR CURRENT LICENSEES? WHAT RETAILERS CARRY OUR PRODUCTS? WHAT ARE THE LABOR CODES OF CONDUCT REQUIREMENTS FOR LICENSEES? WHO DO I CONTACT ABOUT BECOMING A LICENSEE OF THE UNIVERSITY OF MISSISSIPPI? University of Mississippi licensing is overseen by the Collegiate Licensing Company.